An order is a stated intention by a customer to purchase goods and/or services from your company. Their purpose is to help keep track of what you've sold, and to whom, and to ensure that you are getting the right products or services to the right customers. Please refer to Chapter 11, Estimates, Orders, and Service Tickets in the Users Reference Manual to see more about this topic. In Control, orders are normally handled in one of two ways, a new order is created and processed, or an estimate is converted into an order. The steps that are followed to process the order will differ from store to store, so it's very likely your orders' lifecycle will be different in some ways. 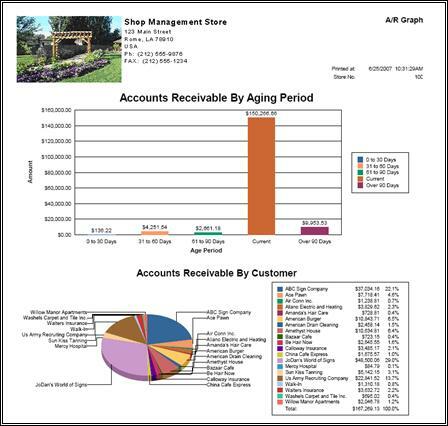 This will be a graphical representation of your accounts receivable information in a bar and pie graph form. Information in the bar graph will be broken down by aging (current, 1-30 days, etc.) and amount due. Information in the pie graph will be broken down by customer's percentage of total amount due. WIP 100.00 This system account is created just to track the WIP's potential sales. Because the order is not delivered yet, there is no income at this time. Orders Due 100.00 This is a System Account to balance the WIP and Built accounts. Bank Account 75.00 Money, money, money! Customer Deposits 75.00 This system account is used to track payments made before the order is a sale. Built 100.00 This system account is created just to track the Built's potential sales. Because the order is not delivered yet, there is no income at this time. WIP 100.00 Removing the balance from the WIP potential tracking accounting. Cost of WIP & Built 35.00 This system account accrues the costs of orders that have been built but are not yet a sale. Wages 15.00 Record the wage expenses in the appropriate account. COGS 20.00 Record the material expenses in the appropriate COGS account. Sales Tax 10.00 Sales Tax is realized when the order becomes a sale. Accounts Receivable 35.00 Balance of the amount owed by the customer.